The house lights once again dimmed and the hush of expectation fell upon the audience. The posing light was turned on illuminating the empty dais that waited like a dish to be served. Bud Parker, the MC, stepped to the microphone and said simply, “Dave Draper“. For the Olympia contest special recorder music was allowed for the first time. I had brought along the music from the soundtrack of “The Ten Commandments” for Dave’s routine. His name had hardly been mentioned, the roar began. I started to wonder why I had brought along any music because no one could hear it anyway. “He’s immortal!” shouted one of the fans who was now standing in the aisle. While Dave looked like the colossus that he is, I felt that I had seen him a shade better on occasion. As he stepped off the stage, the yelling was almost deafening. They wanted more but the modest Draper wouldn’t come back. “Chuck Sipes!” yelled Parker over the noise. Chuck stepped upon the stage to the music from the movie “Ben Hur”. He has never looked better in his life. On top of this, his posing had improved and now he looked for all the world like the best physique of the evening – so far that is. 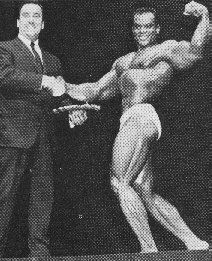 “Sergio Oliva!” yelled Bud. In all the time I have witnessed and written about these events, I have always been able to pull some appropriate words from the gray matter to fit the occasion. Well, I give up. The words to describe Oliva haven’t been invented yet. I may never again see such a display of muscle as long as I live. His musculature was an assault upon believability. At one time, he had size and shape but not much actual separation. Now things were different. In a year’s time, he had become the most phenomenal physical specimen I had ever seen. As he swung from pose to pose, the excitement became almost violent. Hardly anyone could believe what they were seeing. “Harold Poole!” shouted Parker but I doubt if anyone could hear as they shouted for more poses from Sergio. Poole walked slowly to the dais while the music from the “King of Kings” played dramatically in the background. 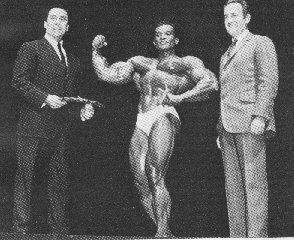 I have always regarded Harold as one of the two or three greatest bodybuilders ever to stand under the posing light. He didn’t let anyone down this evening. If he had ever had any weak point, it was his biceps. Now when he flexed them, they seemed to be one of his strongest assets. The audience went wild and when he went into his famous “most muscular” pose, I thought everyone would come unglued.